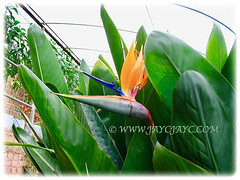 An exotic ornamental tropical plant with stunning flowers that resemble a bird’s head. Without doubt, the Bird of Paradise produces uniquely shaped flowers! This captivating beauty has been chosen as the official floral emblem of the City of Los Angeles. 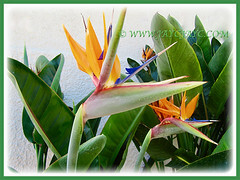 Common Names: Crane Flower/Plant, Bird of Paradise, Bird of Paradise flower/plant, Crane-leaved Strelitzia. Etymology: The genus name, Strelitzia is named after King George III’s wife, Queen Charlotte of Mecklenbury-Strelitz. The specific epithet, reginae means queen. Origin: Native to South Africa (the Cape Provinces and KwaZulu-Natal. It is widely cultivated worldwide. Plant type: An ornamental and perennial tropical shrub. 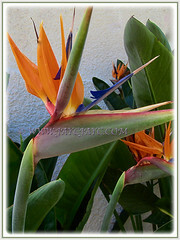 Features: Strelitzia reginae is a species of the genus Strelitzia that comprises of five species of flowering plants. A slow-growing, rhizomatous and clump-forming plant, that grows up to 1.2-2 m in height. The evergreen and greyish-green leaves are large, strong and paddle-shaped, measuring 25-70 cm long and 10-30 cm broad. They are held on petioles up to 1 m in length. The flowers stand above the foliage at the tips of long stalks. The hard, beak-like sheath from which the flower emerges is termed the spathe. This is placed perpendicular to the stem, which gives it the appearance of a bird’s head and beak. The flowers that emerge one at a time from the spathe, consist of three brilliant orange sepals and three purplish-blue or white petals. Two of the blue or white petals are joined together to form an arrow-like nectary. It is commonly referred to as the Crane Plant due to the flowers looking like the feathers on the head of a crane. 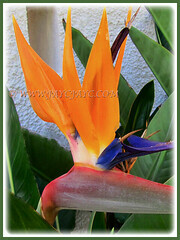 The Bird of Paradise is pollinated by sunbirds. When the sunbird perch on the flowers, its weight on the spathe opens it to cover the bird’s feet in pollen which is then deposited on the next flower it visits. 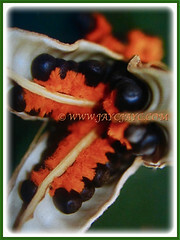 Eventually the flowers will be followed with a leathery capsule containing numerous small black seeds with orange fuzz on one end. 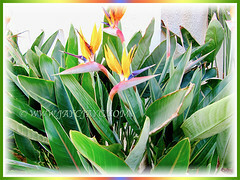 Culture (Care): Strelitzia reginae or Bird of Paradise can be easily grown with minimum care. Light: Full sun to semi-shade. There’ll be more flowers if grown in full sun while planted in shade will result in better looking foliage. Moisture: Moderate water requirements. Keep the soil moist through regular watering but never water-logged. Soil: It is not fussy and does well in almost any type of soil. A standard commercial potting mix that is well-drained will suffice. Others: Pruning is not necessary. However, do cut off spent flowers and withered leaves to keep it aesthetically beautiful. Grow them in large pots or tubs to encourage the plants to flower more readily as they like to be root-bound. Feed the plants with balanced liquid fertilizer or slow-release fertilizer once every fortnightly. Generally free from serious insect or disease problems. Nevertheless, do watch out for scale insects, mealybugs and red spider mites, especially if grown indoors as houseplants or in the greenhouse. For subtropical and temperate regions: Hardiness: USDA Zone 9 – 11. 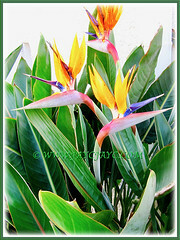 Strelitzia reginae or Bird of Paradise are sensitive to cold and need to be sheltered from frost and freezing temperatures that can damage the flowers and leaves. It requires moderate temperatures year round, preferring them to be in the 10-12°C. They benefit from a humid environment. It produces unique flowers from early spring into early fall. Reduce water in winter for potted houseplants. Feed your plants with a balanced fertilizer once fortnightly during spring and summer but once monthly during autumn and winter. Propagation: Preferably by division of clumps. May be grown from seeds too and must be sown while they are fresh. 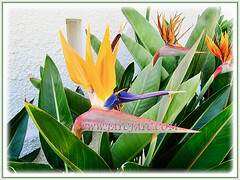 Usage: Strelitzia reginae or Bird of Paradise is perfect as an ornamental landscape shrub. It is excellent when grown on the ground to showcase its exotic bird-like flowers. Ideal too when grown in big containers or large tubs. It is suitable in shrub borders or garden beds. Place them at patios and decks to display their beauty. Grown indoors as houseplants, it adds beauty to your home and commercial interiors. It is suitable for parks and gardens. 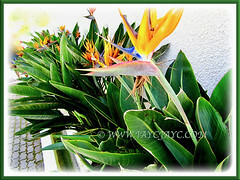 Flowers being long-lasting, they are often used in cut flower arrangements. Plant them as it’s a magnet to birds, especially the sunbirds.